Are you looking for environmentally safe pest control? Your family and environment are in safe hands when we service your home or office. Only low or non-toxic methods are used to manage Termites (White-ants), Spiders, Ants, Cockroaches, Fleas, Bees, Rats & Mice (or Rodents), Wasps, Bedbugs, Feral cats or Possum Trapping, Bird Lice, Carpet Beetles and Silverfish. We use Integrated Pest Management (IPM) methods to get rid of pests which include non-toxic baits and low toxic, safe insecticides such as Pyrethrin and non-fuming synthetic pyrethroids. So, no ‘choking fumes’ are sent into the air, and they are classed as “child and pet friendly”. Where possible, we look for all the non-toxic procedures first to keep your home or office safe from intruding pests. To keep employees and your family safe, we prefer to use only non-toxic pest control methods and use low toxic solutions only when necessary to solve problems. In order to get you maxim effectiveness, we will cover all internal and external areas including roof voids with normal ladder access in metro Sydney. The reason why cockroaches are associated with nasty and disgusting insects is because they can carry different diseases and let’s be honest they don’t look pretty either. Cockroaches can be very social believe it or not, they eat anything, yes, ANYTHING like paper, clothes, soap, coffee grinds, hair, glue, feces, human food, cigarette butts and even each other. Now you have one more reason to call them disgusting! They are also very fast insects, in fact, they are one of the fastest insects on earth. They can change directions while running at full speed. There are more than 400 species of cockroaches but only about 6 of them are considered pests. The Cockroach has long been an infamous and resilient pest, plaguing home owners as well as businesses and having a negative impact on the state of your property. We’ve written up an article on the American Cockroach which contains exact information about the American Cockroach species which will help you differentiate it between the other common species. Another popular variety of ‘roach found in Australia is, as expected, the Australian Cockroach. They’re a bit smaller than their counterpart (the American Cockroach) but just as disgusting and hazardous to your health. Cockroaches are infamous carriers of disease and have gotten extremely efficient at contaminating food as well as food preparation areas. If you’d like to know more about the Australian Cockroach specifically you can check out our article on the Australian Cockroach which cites scientific information, great if you’re looking for specifics. Most ants live in more or less permanent nests, but in adverse conditions of nest location is common. Typically, worker ants forage from nest for food. Many species do this by traveling in fairly well-defined trails, once a food source has been established. Methods employed in a trail marking may include reference to landmarks, orientation with respect to light and, very commonly, the laying down of ;scent trails’ in the form of trail-marking pheromone secretions. More generally orientation and communication in ants may rely on smell (as in trail-marking or alarm pheromones), taste (as in food exchange by regurgitation), hearing (as may be the case with tapping and stridulation), touch (as in antennal stroking), or sight (in ants with well developed eyes). Known for their hard work and persistence ants can be a hassle to get rid of and a nuisance around the house. It usually takes more than a mere surface spray to get them gone. If you’re struggling with ants and would like to know more about the specifics you can read up on the Argentine Ant, an article which covers a more anatomical and habitual side of the ant. There is a bedbug plague in Sydney at the moment (just when we had seen the last of them!). It’s not hard to find out if you are having a bed bug infestation as you wouldn’t probably be having good nights of sleep without being bit by them. Waking up with irritation marks on your body is a sign that bed bugs may be present.Don’t find it strange if you have a spotless house but out of nowhere started having bed bugs issues. They can get into your house coming in the luggage if you travel overseas, cruise ships or even cheap hotels. We have articles that you can read on Bed Bugs and Bed Bug Extermination for more information and tips on how to manage them. The insect world contains over a million different species (kinds) of insects. Scientists divide them into large groups called orders. All the insects in an order share certain characteristics. Bees belong to the order Hymenoptera. The name means ‘transparent (see-through) wings’, which bees have. Bees are found in most parts of the world except very cold places and tiny ocean islands. Experts have identified 20.000 different bee species. Many types live alone for most of the year, but over 500 species are social. They include honeybees, bumblebees and stingless bees. Honeybees live in colonies larger than those of any other bee. Bees are usually a worry for most of us especially when there is a hive near the window or an entrance door. Bees get really aggressive when there is a movement around the hive. They often make their hives near the trees, on house weep holes (ventilation holes), and under the tiles on roof. Bees, though helpful and beneficial to the ecosystem, can be a pest when young children are at stake or someone with allergies is victim to a sting. We’ve written a few articles on Bee Control to help you discover more about bees and how to manage them! Another infamous cockroach species rampant in Australia is the Brown-Banded Cockroach. Though they only measure 10-15mm, less than half the size of the Australian/American Cockroach, they are still formidable and just as resilient. These little buggers spread like wildfire and multiply just as quickly, you can read more about their specific anatomy for visual identifiers or clues when trying to find out what cockroach species you might have in your home by reading this article on the Brown-Banded Cockroach. A pest that seems to be attracted to parties and barbecues and always there when you’re just about to fall asleep. Mosquitoes are well known for there annoying buzz and frustrating bites. We’ve taken the time to write up an article on the Brown House Mosquito to help you understanding them better as well as give you the contact info to give us a buzz! The fact that they can fly just makes them more of a pest. The females, that feed on blood, are almost like a flying tick as they indulge in parasitic feeding habits. If you’d like to learn about these little vampires here’s an article on Biting Midges that contains the necessary scientific and anatomical facts, you can also ring us up on 0417 251 911 to discuss treatments or appointments if you’re currently beleaguered by them and w’d love to take care of it. Yet another ant species found commonly in Australia, the Black House Ant is quite happy to take up residence in your home or yard. We’ve dealt with many species of ants and various types of ant infestations in our 30+ years of work in the pest control industry. Call us up or contact us via our contact us page and we can discuss appointments or quotes, we’ve also included the article on the Black House Ant which contains useful information and tips. Booklice have been around for millenia and they’ve just managed to get more annoying as pests. Their name actually stems from the greek word psokos, so we know as far back as the Greco-Roman era they were busy frustrating humans. If you’re encountering these bugs in your home or on your property or if you just want to learn more we’ve written up a helpful article on Booklice / Psocoptera and would be happy to assist you with completely exterminating them. Not many citizens will be familiar with the cigarette beetle unless you’ve had them plague your dry goods before. If you have a Cigarette Beetle problem then ring us up and we’ll help solve your problem in no time. You can also read more about the Cigarette Beetle and find some helpful tips also! These pests are proficient at ruining your beloved clothes and linens! Even their larvae like the taste of clothes and won’t hesitate before getting down to it. A Clothes-Moth infestation isn’t impossible to deal with though, you can have a look at our descriptive article on the Casemaking Clothes-Moth for more information or ring us up straight away on if you need to book an appointment! The drugstore beetle (also known as a bread/biscuit beetle) is one of the most common non-weevil insects that infest products and are found globally. They might seem harmless but in full force they can be quiet the pest so don’t wait until it gets out of hand to then contact a professional. You can ring us upor contact us online. We also have an really helpful article on the Drugstore Beetle that you might wanna read. Fleas are small, it prefers warm, humid conditions and hence are often a pest during summer. High humidity favours the development of larvae, which may be populous both indoors and outdoors, where sandy soils (particularly if under cover from rain) are favored. When climatic conditions are favorable, the development of larvae outdoors cab be very widespread. They’re a very unique species of pest and if you were keen to learn a bit more have a read of our article on the Cat Flea. The furniture beetle is a fairly common insect, also known as the House Borer, and feeds upon wood. They also lay their eggs in the cracks. One or two might not be much of an issue to some people, but as soon as new larva start hatching and boring away into the wood you’re in a spot of bother. We’re happy to help so ring us up as mentioned above or use our online messaging system, contact us, and we’ll get back to you. You can also read more about the Furniture Beetle. The Garden Slater doesn’t pose much of a threat to people and might slip by under your radar. However, they do love feeding on decaying plant material or new saplings, so to the avid gardener they can be a nightmare! We’ve got an article on the Garden Slater that you can have a read of to learn a bit more or you can go straight ahead and shoot us a message, contact us, or ring us up on to discuss treatment of a Garden Slater population or another pest problem. Everyone hates a roach. Whether they’re in the kitchen or out in the shed they’re still a disgusting pest and they reproduce like crazy. We hate them too, but we love getting rid of them. You can read more about them in this article: German Cockroach, or go straight ahead and ring us up if you’d like to see us in action. Hide beetles are fairly inconspicuous and you might not even pick up on them around the home. If you come across them be aware that they prefer protein rich products to feed on. If you want to know more about them read this short article that will give you a more comprehensive understanding of their habits; The Hide Beetle. We’re always happy to treat your pest problems so don’t hesitate to give us a call or shoot us a message in our “contact us” webpage. Huntsman are fairly well known due to their ominous appearance. They’re down right creepy! But for a spider so large and scary looking they’re actually quite harmless, and in most cases seeing one or two isn’t the end of the world, yet when young children are involved or you see an abundance of Huntsman you should take preventative measures. Contacting a pest control specialist would be first priority as they can advise you on the situation. Feel free to ring us up for a quote or appointment any time! We also have a great article on Huntsman Spiders that could be of use to you. Landhoppers have never been classified as a pest and as such you probably don’t need to worry about them. They’re more common abroad in the developing world. If however, you do find that you are swamped by them then ring up a pest controller. Also consult our article on Landhoppers for more information and a specifications on their species. Powderpost beetles are another species of burrowing/woodboring beetles. They’re not as common as other pests but once they take a foothold they are hard to counteract and can lead to the deterioration of your favorite timber furniture or flooring. We’ve written up an article on the Powerderpost Beetle for you to have a read of. Redbacks are infamously poisonous and very hard to manage. We would strongly advise against any personaly attempts to control Redback infestations. If you’ve found that surface sprays aren’t doing anything to help then ring us up today and we can organize an appointment on short notice, 0417 251 911. Or if you’d just like to learn more about the Redback species then read our Redback article. Trapping: using traps or glue boards to physically capture rodents. Chemical control: which may involve a variety of chemicals and techniques. Rodents always find a perfect place to stay around humans, we provide them food, water and shelter. In order to get rid of them there are a few steps to be done. First is to find the source, where they are coming from. Having a good plan in place to get rid of them is the next step. Good sanitation helps more than any pesticide, keep the place clean, free of rubbish and water leakage. Proofing is the last step to keep the rats and mice away. Mosquitoes are definitely one of the more annoying pests, even though they aren’t much of a threat to human life. they’re buzz can still be a complete bummer at BBQs, your business or restaurant. We’ve taken the time to write up a great informative article on the Saltmarsh Mosquito for more on the Salthmarsh mozzie. If you wanted to know more about silverfish feel free to read up on our Silverfish article. We’re also happy to assist with an appointment or quote, even if it’s a bit last minute and you’re in need of quick service. They might not sound like a big threat but if you have valuable books or stored files you definitely need to keep an eye on Silverfish activity. We can be reached at 0417 251 911 and we’d be happy to discuss a quote or organize an appointment. Eliminating spiders from an area for a long period of time is almost impossible. Spiders do not congregate in a single large nest, so the population cannot be destroyed by targeting one site. 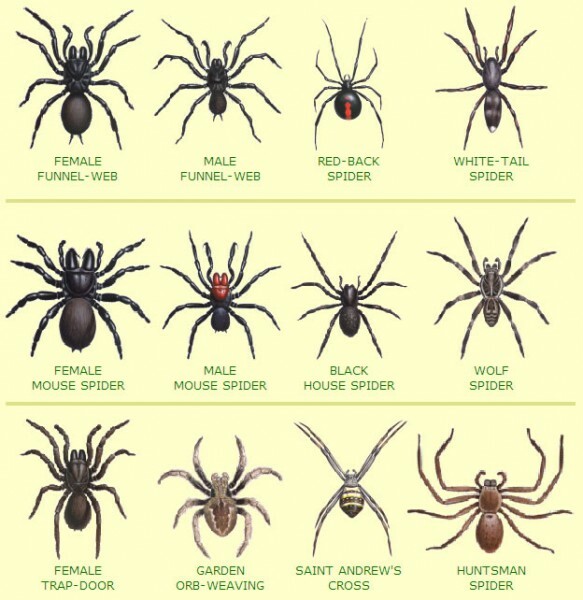 Get rid of Spiders safely by reducing harmful spider populations using a pest control expert. Don’t try and kill spiders by yourself by using aerosols or other dangerous poisons. This may be more dangerous than the actual spider threat! Most arachnids are nocturnal. During the day, they are seldom seen, unless they are disturbed in their natural environments. When the daylight fades, spiders become active. They leave the protection of their burrows or shelter and go out in search for food or, in the case of web-spinning spiders, construct their webs to snare prey. As day breaks, most spiders seek safety and go back to their shelters again. There are more than 9000 different species of ants found worldwide. All types of ants are social. Some ant colonies are very large, and contain many thousands of individuals, some ants nest high in trees, but most live underground. The Red Imported Fire Ant (Solenopsis invicta), is a new pest now found in Queensland, Australia. Termites live in colonies, which are assemblages of different individuals with definite functions or tasks. The size of the colony varies from a few hundred, as in Neotermes insularis, to hundreds of thousands or even millions, as in the mound-building species Nasutitermes and Coptotermes, and also destructive Mastotermes darwiniensis. The colony takes various forms; some species build mounds, some nest underground and some live in small colonies in trees. There are 5 main forms: Ground mound, arboreal mound or tree nest, pole nest, subterranean nest or tree wood. Termites have long been recognized as white ants; however this really is not really completely correct. For sure, they’re white, however termites only look like ants. Really, termites tend to be more directly associated with cockroaches biologically. Termites in Sydney Australia have caused more damage to our homes than flooding and fire combined, termites attack about 35% of the houses. If you suspect you’re a victim of termite activity or just want to learn more about termites then have a look at our termite articles. We’ve all heard of someone, either a friend or an acquaintance that has suffered at the hands and teeth of termites. 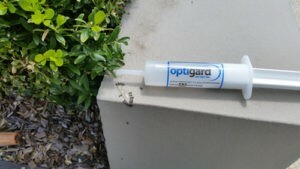 They are very subtle pests and can wreak thousands of dollars in damage before you even see them! We’d highly advise having a look at our article on Subterranean Termites, and ringing us up if you believe you have a termite infestation on 0417 251 911. Wasps are particularly a diurnal (day-time active) insect. They can be caught and destroyed more easily and safely at night, when they have congregated on the paper or mud nest. We have two major wasps species here in Australia, the first one is the European Wasp and English Wasps but separating the two species is normally beyond the ability of pest controllers. Each wasp nest usually last for one year, but in warmer climates the nest may survive and extend. In winter the males die off, and the newly fertilised queens hibernate to build other nests the following year. Read up on Wasp Extermination. Yet another species of termite that might be digging into the roots of your lovely home! Have a read on this unique termite species in our article on the West Indian Drywood Termite. And if you find indicators that point to a termite infestation then don’t hesitate to ring us up and book an appointment! We’re happy to do it last minute.